Gladys Hasty Carroll '25's first novel for adults, As the Earth Turns, was released in 1933. The results were immediate and astonishing. The story of a farm family in southern Maine vaulted up best-seller lists, was chosen by the Book of the Month Club and was snapped up by Hollywood. Critics praised the book for its insight and honesty. Carroll went from little-known children's writer to national celebrity. Time passed, tastes changed, and Carroll's literary fame faded. But to Carroll, of South Berwick, the worst indignity was not being overlooked, but being misunderstood. Later readers and scholars -- many from outside the state -- read her story but dismissed her largely positive portrayal of rural Maine life, she says. "They said Maine life isn't like that and never was," says Carroll. "But I know it is true." Now, Carroll is having her say about Maine once again. Last summer, the Maine Humanities Council and Blackberry Books rereleased As the Earth Turns as part of The Century Project, which studies and explains the impact of modernism on Maine. The novel now is being read and discussed by informal study groups and in classrooms throughout the state. The rerelease of As the Earth Turns also has led to rediscovery -- and a fresh appreciation -- of Carroll herself. In the past year, the author has been the guest of honor at a Maine Humanities Council banquet. Recently, she spoke about the book at Boston University, whose library stores her papers and manuscripts. She has received the Maryann Hartman Award from the Women in the Curriculum program at the University of Maine. Past award winners included May Sarton, Berenice Abbott, Olympia J. Snowe, and Margaret Chase Smith. Carroll is delighted that her book has been republished. Again, she has a chance to trumpet what's good about rural and family life. Yet she seems a bit put off by all the attention. She laughs self-consciously about the reporters who have trooped to her home and described, in great detail, her life. "It used to be," she says, smiling, "that I met with reporters in hotel lobbies and the like. Now, they want to come to my house." Carroll, 91, lives in the farmhouse that her grandfather built during the Civil War. Her daughter lives with her. Here in Dunnybrook, a small hamlet in South Berwick, she is never far from the land or from the past. The years have slowed her step and stooped her somewhat. With a smile, she apologizes for her lapses in memory. Yet a moment later, she relates in great detail the furnished apartments she rented in the early 1930s and stories of Maine's pioneers she heard as a child. And time hasn't dulled the intense gaze and dark eyes that are so prominent in photographs taken of her when As the Earth Turns was first published, sixty-two years ago. Sitting in her small parlor, she is surrounded by photographs of family. Stiff poses of the nineteenth-century portraits slowly give way to the colorful grins of recent snapshots of great-grandchildren. Carroll's connection to this place is three centuries deep. Her relatives cleared the land, planted the fields, fought the revolution and the Civil War, and returned to plant again. The dead are here, too, in small graveyards on Carroll's field and on the corner across from her front door. Farming and family and community were central to life here well into the twentieth century, she says. And it was a happy life. "Everything we did," she wrote, years later, "we did over and over. The few people we saw, we saw constantly. I loved every minute of it." Yet like so many rural Americans of this century, Carroll left the farm. She attended Berwick Academy and graduated from Bates in 1925 (she would receive an honorary degree in 1945). Then she married Herbert Carroll '23. Study and work took them to Massachusetts, Illinois, New York, and Minnesota. He studied and then taught psychology. She wrote magazine articles and books for young audiences. She had begun writing stories, she says, almost as soon as she could write. The reason? She needed more things to read. As an adult, it seemed a fine occupation. Often, she wrote of the farm she had left behind. As the Earth Turns was written in longhand -- Carroll dislikes typing -- in a series of rented apartments in Minneapolis. Her husband had his first full-time teaching job at the University of Minnesota. She was homesick. "Everything was so strange to me in Minnesota," she says. "We were in three different apartments in the six or seven years we were there. The people were different. They were kind, but they weren't my people. I just had a great longing to write a love letter to them, I guess." As the Earth Turns follows the fictional Shaw family, and their southern Maine farm, through a single year. The Shaws, like farm families throughout America, were facing difficult times. Money was tight. Immigrants were moving into traditionally Yankee neighborhoods. The lure of the city tugged at many family members. One Shaw son runs away to fly airplanes, another leaves for college. Some Shaw daughters trade the grind of the farm for the drudgery of an office in the city. Some who stay on the farm crumble under the unceasing work, the hard weather, and the limitations of rural life. Yet at its core, As the Earth Turns is a loving view of Maine farm life in the late 1920s and early 1930s. The main characters -- Mark Shaw, the father, and his young daughter, Jen -- find joy in their family and in the land and the repetition of seasons and chores. Distant cities and factory jobs can't tempt them away. They welcome the new immigrants, including a family of Poles, because they see in those immigrants the seeds of a rural renewal. Jere Daniell, a professor of history at Dartmouth College and a Millinocket native, says As the Earth Turns was released to a nation hungry for such works. Rural New England was in crisis. The populations of rural neighborhoods were evaporating as young people fled to the cities. People feared that American farm life was ending. At the same time, American city dwellers were being battered by the Depression and buffeted by political uncertainty. As the Earth Turns appealed to both groups. Rural New Englanders saw it as a chronicle of a fondly remembered past. Urbanites considered the book a vision of stability and bucolic romance. Carroll's Civil War-era farmhouse in Dunnybrook is shown here in a photograph by George French '08, whose Maine photos are featured elsewhere in this issue. Carroll, however, did not want to celebrate rural life from afar. Several years after As the Earth Turns, Carroll came home for good. Her husband began teaching at the University of New Hampshire. She went back to writing and to raising her son, Warren, born in 1932, and her daughter, Sarah, born in 1941. In 1934, a film version of As the Earth Turns was released. Carroll and her neighbors in South Berwick, unhappy with the screen version, decided they could do better. From 1935 to the outset of World War II, townspeople gathered annually at Dunnybrook to stage an outdoor drama based on the book. Carroll continued to promote farm life in books and articles. But none of Carroll's later works had the huge commercial appeal of As the Earth Turns. 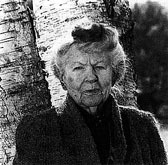 Many so-called "regionalist" writers like Carroll fell from favor with audiences as America entered World War II and then the Cold War. They were viewed as having little to say about the universal conditions of humanity. In recent years, however, American scholars and general readers began seeking out those overlooked regional writers. Their views of land and community are increasingly valued. "Important history is not necessarily lived in Eliot's London or Joyce's Dublin, which was modernist view," said Lewis Turlish, professor of English at Bates. "One of the things we're sensitive to now is the importance of a life lived 'elsewhere,' that is, away from the bright lights, big city." Turlish points to Marilynne Robinson (Housekeeping) and Jane Smiley (A Thousand Acres) as contemporary regional authors who, like Carroll, have examined the human condition by looking at lives lived "elsewhere." Carroll's return to prominence also comes amid a broadening interest in rural life and writing. Among the most popular recent Maine novelists are Cathie Pelletier and Carolyn Chute, both of whom have written about rural families and small communities. Carroll remains committed to the little community that fostered her talent and gave her fodder for her books. Yet she is unsure how long her family will remain connected to its home. Her husband died in 1983. And she does not think any of her relatives will want to live in the old home after she is gone. So she has founded the Dunnybrook Foundation, a group she hopes will care for home and other properties after her death. But while she still loves the place, Carroll says she will write no more novels about it. It's not that she can't write, she says. She's simply afraid she will start a book and die before she's done. Reprinted courtesy of the Maine Sunday Telegram. Additional material added prior to publication in Bates Magazine.